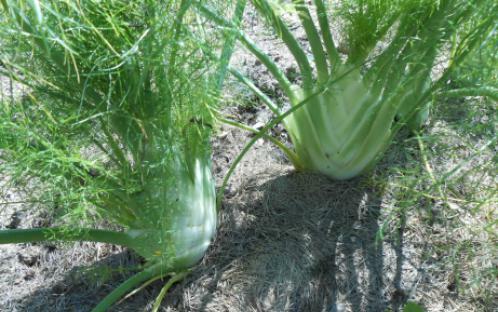 Florence fennel: grown primarily for the bulb-like base which is eaten as a vegetable. Leaves and seeds can also be harvested. Common and bronze fennel: grown for the seeds, but not recommended due to invasiveness. Transplant or direct seed February–April (maybe May), September–October (maybe August). If growing from seed for transplants, allow 4 weeks to be ready. Harvest the bulb-like base when it is large and plump, 4–6" across, typically 60-90 days after transplanting. Cut just above the soil line. Pollen can be collected from flower blooms by shaking flower heads into a plastic bag. Pick leaves at any time during the growing season. Do not remove more than 1/3 of the foliage. Harvest seeds when flower heads turns brown. Cut the seedheads and place in a paper bag in a cool, ventilated, location. The seeds will fall off when dry and can then be collected. Fennel is perennial, but is grown as an annual for harvesting as bulbs. Fennel bulbs grow best in cool weather. 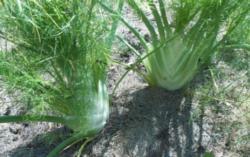 Fennel will self-sow easily and can become weedy if not controlled. Common and bronze fennels are invasive pests in California. Fennel is a host plant for swallowtail butterflies. Fennel Di Parma, OP Superior bulbing fennel, large and uniform, with great flavor. Flowers attract beneficial insects, and swallowtail butterflies will lay eggs on the feathery greens. 24–36" tall. Plant 10–12" apart.